RI Legislators introduce Offshoring Prevention Act....AGAIN! 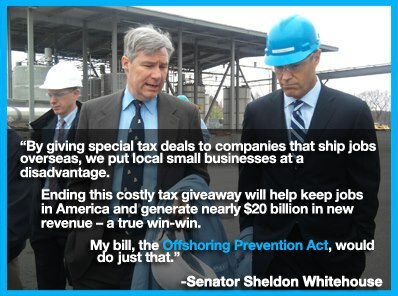 Senator Sheldon Whitehouse and Congressman David Cicilline announced the introduction of the Offshoring Prevention Act. The legislation aims to eliminate special tax breaks for companies that ship jobs overseas. It would eliminate federal tax breaks for U.S. companies that manufacture goods abroad for sale in the U.S.
"I have heard from too many Rhode Island small businesses that are fed up with unfair competition from abroad," said Whitehouse, who first introduced the Offshoring Prevention Act in 2011. "By giving special tax deals to companies that ship jobs overseas, we put local small businesses at a disadvantage. Ending this costly tax giveaway will help keep jobs in America and generate nearly $20 billion in new revenue – a true win-win." These are the type of bills we need to stand behind and advocate for! This was first introduced in the summer of 2011 but never made it out of Committee. There have been other bills to help the Long Term Unemployed that have fallen by the wayside because no one paid attention. Too busy pushing for extensions of benefits. I am guilty of that as well. As we all know now, these extensions didn't help anything. It just made the unemployed long term unemployed and now considered to be gone from the workforce. Anyone remember HR 1113 introduced in the 111-112th Congress by Rep. Hank Johnson of GA? It would have made discrimination against the LTU a part of the Civil Rights Act. That also never made it out of Committee. Sad thing is, that type of bill wouldn't have cost anything substantial to the taxpayers. I support and thank my Senator and Representative for not giving up, and pushing this outsourcing bill forward again in the 113th Congress!! Re: RI Legislators introduce Offshoring Prevention Act....AGAIN! Wow, this is great news! It restores my faith in our elected officials. Now name 10 companies that will lobby to prevent the Offshoring Prevention Act from becoming law because of their lobbying efforts. Cicilline and Whitehouse first proposed the same bill in June of 2011 but it never made it past committee. Will it make it out of committee this time? USA Citizen wrote: Now name 10 companies that will lobby to prevent the Offshoring Prevention Act from becoming law because of their lobbying efforts. Cicilline and Whitehouse first proposed the same bill in June of 2011 but it never made it past committee. Will it make it out of committee this time? If it doesn't, the State of Rhode Island and Providence Plantations will be a ghost town. Things are only getting worse here. Two of our major employers, Hasbro and MetLife, have announced major lay-offs, and jobs are being sent elsewhere. Hey, I can hope this bill makes it this time. I don't have anything left except hope.